GST enable Online ERP software? ERP software with international standard? to your business resource planning? Nelso® ERP is a cloud based Enterprise Resource Planning software which is designed in such a way that it does indicate a new era to the business resource planning irrespective of the size of your business. Time has already come to implement a suitable ERP software which guaranties a return on investment. In order to eliminate cascading effect of indirect taxes, Govt. of India has already introduced Goods and Service Tax (GST) from July 1st 2017. As per our national leaders and finance experts GST process will be smooth and accurate if you have an accounting system which is GST enabled. Nelso® technology Pvt. Ltd. has introduced Nelso® ERP which will not only automate your GST calculation and GST return process, also this ERP will help you to manage this newly implemented tax system without taking any external help from finance and tax consultants.You can register now and use this GST enabled ERP software and manage your business more efficiently. GST functionality is available with all our ERP modules. We have ERP software for all kind of businesses and we welcome you to our ERP world which will surely take your business to a different level. Our product has got range of functionalities which will surely help you to maximize the profit and also will provide that competitive edge you’ve been looking for. Nelso® ERP understands the functionality as a business you want in your enterprise resource planning software. It provides the opportunity to manage every aspect of your business more efficiently. We believe in quality software development in order to meet unique business needs of our customers. Our goal is to build solutions not only software. Nelso® ERP helps you to merge and synchronize wide array of business functions in a single platform. A smart web based ERP solution with rich set of functionality which help you to stay ahead in the highly competitive business environment. Nelso® ERP is one of the best cloud ERP solutions for Indian market. This cloud based ERP software has got wide range of easily customizable functions, it shows you the right path to increase revenue and productivity. 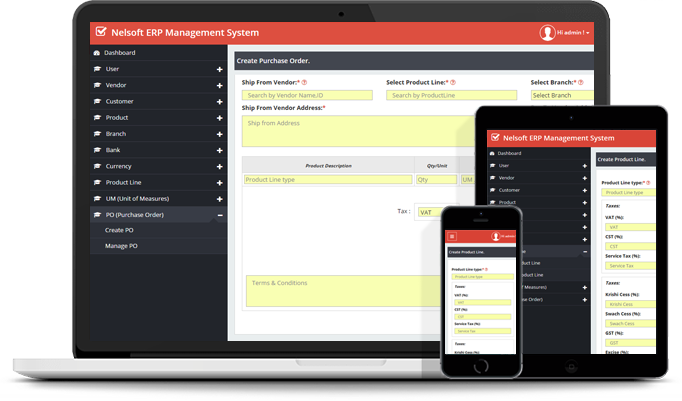 This is the most cost effective ERP software currently available in India. Enterprise resource planning (ERP) is business process management software that allows an organization to use a system of integrated applications to manage the different areas of business in a very systematic way. Improve consistency and accuracy, Better Analytics, Operational efficiency, Enhance productivity, Balance on supply, stock, manufacturing, Happier Customer, Demand and forecasting, Data security, Integrity in Business Processing, Profit, sales, purchase etc.